Tye, aka Okie Tye, is a 9-year-old black female born on January 15, 2002. Her dam is Okie Renny and her sire is Grenade, making her grandsire the late, famous Molotov which is clearly where she gets her pretty white blaze and stockings. Tye had a 64 race career starting at Southland on July 16, 2003, and ending at Wheeling Downs on August 30, 2004. She went on to whelp several litters of puppies from January 2006 to January 2011. Now she is finished with puppies and ready to meet some loving people she can call her own. It is not known if Tye is small animal or cat tolerant at this time. 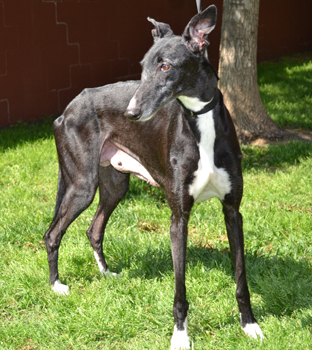 Tye is a very laid-back older lady who gets along well with my other 4 greyt ladies. She is very loooong in appearance...but she will fit in the smallest spaces. 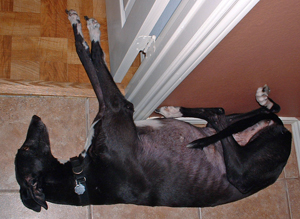 Her favorite position seems to be up against a wall with her feet in the air...so she's my "wall dog" foster. She is very good at walking on a leash, riding in the car, and taking treats with my other "girls". She's a tall girl who can see everything up high on the counters, so she doesn't feel the need to put her paws up there to investigate. She sleeps on a dog pillow at night or up against a wall or just about anywhere. She loves to get petted and to be where you are with her beautiful face looking into your eyes. She is definitely glad to give up her puppy producing days and would love to fit into any space in your house - and she has greytly added to the happiness in mine! 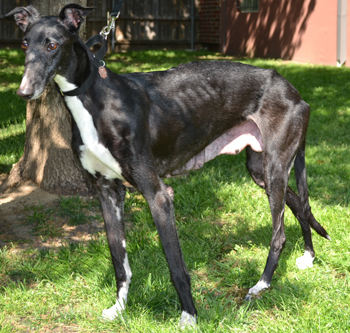 She is a very beautiful lady who is ready to find her furever home. She says, "Gotta' Luv Me! I'm Special!"